I think that the first encounter to Kimonos was when I was in my mother’s belly. My mother was a Wasai-shi(sewing kimonos) so I had been familiar with Kimonos as long as I remember. I haven’t always been interested in Kimonos. I thought, as a child, that a kimono was just a dress for special occasions. I was always very curious when I was young, and most of my interests were outside of Japan. I spent several years working and studying overseas when I was in my twenties. After spending several years in such an environment, I was aware of my ignorance about Japanese tradition and culture. 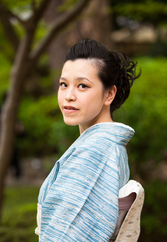 Even I had been familiar with Kimonos since I was a child, I couldn’t wear a kimono by myself. I returned to Japan when I was twenty-four. I might have myopic thinking but decided to become a Kitsukeshi (a kimono dresser). I did this because I thought that Japanese people living overseas, like me, had many opportunities to wear Kimonos and needed many kitsukeshi and teachers. At first, I felt that I wanted to do something to do with Kimonos, but the more opportunities I had to wear Kimonos, the more excited I became out them. After I got my qualification as a Kitsukeshi, I opened kimono dressing schools and Kitsuke services in some cities here in Japan and also in Hong Kong in China. What I found through my kimono business was the fact that Kimonos were not only loved by Japanese but also by people from all over the world. I would like to continue my kimono activities and services to share the charm of Kimonos and provide a variety of activities for people who would love to enjoy Kimonos.